Alzheimer’s disease (AD) is the most common neurodegenerative disorder, which is clinically associated with a global cognitive decline and progressive loss of memory and reasoning. According to the prevailing amyloid cascade hypothesis of AD, increased soluble amyloid-β (Aβ) oligomer levels impair the synaptic functions and augment calcium dyshomeostasis, neuroinflammation, oxidative stress as well as the formation of neurofibrillary tangles at specific brain regions. Emerging new findings related to synaptic dysfunction and initial steps of neuroinflammation in AD have been able to delineate the underlying molecular mechanisms, thus reinforcing the development of new treatment strategies and biomarkers for AD beyond the conventional Aβ- and tau-targeted approaches. Particularly, the identification and further characterization of disease-associated microglia and their RNA signatures, AD-associated novel risk genes, neurotoxic astrocytes, and in the involvement of complement-dependent pathway in synaptic pruning and loss in AD have set the outstanding basis for further preclinical and clinical studies. Here, we discuss the recent development and the key findings related to the novel molecular mechanisms and targets underlying the synaptotoxicity and neuroinflammation in AD. Alzheimer’s disease (AD) is the main cause of dementia accounting for over 70% of dementia cases world-wide (Prince et al., 2016). AD is clinically manifests as memory impairment and executive dysfunction interfering with daily activities, rendering the affected incapable of independent living (Scheltens et al., 2016). The defining neuropathological features of AD consist of accumulation extracellular amyloid plaques and intraneuronal neurofibrillary tangles (NTFs), comprised of densely packed amyloid-β (Aβ) peptides and phosphorylated tau, respectively (Scheltens et al., 2016). According to prevailing amyloid cascade hypothesis, accumulation of these proteins are considered to follow a temporal sequence, with Aβ accumulation triggering a cascade of events comprising NFT formation, synaptotoxicity, mitochondrial dysfunction, and neuroinflammation due to aberrant activation of microglia and astrocytes (De Strooper and Karran, 2016). Aβ is derived from the amyloid precursor protein (APP) via sequential proteolytic cleavage by β- and γ-secretases (Zhang et al., 2011). Despite the accumulation of Aβ being a hallmark of AD, the physiological functions of APP remain largely undetermined with previous research highlighting potential roles for APP in processes, such as neurite outgrowth, axonal protein trafficking, transmembrane signal transduction, and calcium metabolism (Van Der Kant and Goldstein, 2015). Therefore, it is expected that lowering the Aβ levels is sufficient to slow down the disease process in AD, if started early enough. This concept is supported by the identification of a protective variant in APP gene (APP A673T), which reduces significantly the risk of AD and associates with decreased plasma levels of Aβ in individuals carrying protective APP variant (Jonsson et al., 2012; Martiskainen et al., 2017). However, the reported Aβ-targeted trials in AD patients to date have not been successful, addressing the need to test alternative therapeutic approaches beyond Aβ focusing on other key early events, including synaptic dysfunction, hyperphosphorylation and aggregation of tau or the initial steps of neuroinflammation. In this review, we summarize and discuss the recent development and the key findings related to the novel molecular mechanisms and targets underlying synaptotoxicity and neuroinflammation in AD. In AD, synapses are considered the earliest site of pathology, and reduced synaptic activity is found to be the best pathological correlate of cognitive impairment in AD (Coleman and Yao, 2003). Furthermore, several studies have demonstrated that pathological elevation of Aβ levels reduces glutamatergic synaptic transmission, resulting in synapse loss (Snyder et al., 2005; Tackenberg et al., 2013; Tu et al., 2014). Despite the pathological functions of Aβ, intermediate Aβ levels are considered necessary in presynaptic regulation (Figure 1; Abramov et al., 2009). Also, synaptic activity modulates Aβ production (Parihar and Brewer, 2010). Increased synaptic activity is thought to enhance endocytosis of APP, enabling increased Aβ production and potentiating Aβ secretion (Cirrito et al., 2008). Consequently, these relatively small increases in Aβ abundance have been shown to potentiate synaptic vesicle recycling, potentially through activation of α7-nicotinic acetylcholine receptor (Lazarevic et al., 2017). However, excess accumulation of Aβ has been shown to promote excitotoxicity, triggering long-term depression (LTD) in synapses, potentially as a result of postsynaptic N-methyl-D-aspartate receptor (NMDAR) desensitization, NMDAR and α-amino-3-hydroxy-5-methyl-4-isoxazolepropionic acid receptor (AMPAR) internalization, and overstimulation of extrasynaptic NMDARs (eNMDARs; Coleman and Yao, 2003). Postsynaptic activation is tightly regulated by the number of active plasma membrane-localized NMDARs and AMPARs. NMDAR activation has a pivotal role in synaptic transmission, as it is capable of inducing either LTP or LTD, by regulating the extent of intracellular calcium (Ca2+) levels and thus activation of downstream pathways related to AMPAR trafficking (Lüscher and Malenka, 2012). Induction of LTP requires activation of NMDARs, leading to a large increase in postsynaptic Ca2+ levels and activation of downstream events, including re-localization of AMPARs to the plasma membrane. In contrast, LTD induction requires NMDAR internalization, activation of extrasynaptic NMDARs and modest increases in Ca2+ levels (Lüscher and Malenka, 2012). Figure 1. Schematic representation of the suggested alterations induced by excess accumulation of Aβ in the brain. Aβ oligomers and plaque-like structures build up due to increased amyloidogenic processing of the APP and/or disrupted Aβ clearance systems, including enzymatic degradation (autophagy-lysosome degradation), transport across the blood–brain barrier (BBB), bulk flow of interstitial fluid (ISF) and glymphatic clearance, and absorption to the cerebrospinal fluid (CSF) and further into the circulatory and lymphatic systems. The increase in intracellular Aβ oligomer species may disrupt synaptic transmission and induce postsynaptic hyperexcitability, resulting in Ca2+ dyshomeostasis, increased mitochondrial reactive oxygen species (ROS) production, and internalization of α-amino-3-hydroxy-5-methyl-4-isoxazolepropionic acid receptors (AMPARs), leading to synaptic depression (dashed circle). Furthermore, accumulation of intracellular Aβ results in hyperphosphorylation and mislocalization of tau to postsynaptic sites, which disrupts tau functionality and alters recruitment of essential proteins required for synaptic potentiation, such as FYN and post-synaptic density protein 95 (PSD-95). Moreover, the increased Aβ burden results in aberrant activation and dysfunction of immune cells (astrocytes and microglia), leading to excess production of various inflammatory cytokines and chemokines, and impairment in functions, including Aβ phagocytosis. Emerging evidence suggests that Aβ-induced excitotoxicity results from aberrant stimulation of NMDARs, potentially due to the impairment of the regulation of glutamate levels or plasma membrane NMDAR composition (Figure 1; Falcon and Gentleman, 2007; Matos et al., 2008; Li et al., 2011; Ferreira et al., 2012). Excess glutamate in the synaptic cleft can potentially desensitize NMDARs, not allowing sufficient Ca2+ influx and LTP induction (Shankar et al., 2007). Additionally, increased glutamate levels may result in overstimulation of eNMDARs, triggering aberrant activation of redox-mediated events as well as Ca2+ dyshomeostasis, among other downstream events (Hardingham and Bading, 2010). Consequently, increased Aβ levels have been associated with increased AMPAR internalization and thus enhanced LTD (Figure 1; Guntupalli et al., 2016). The relevance of NMDAR overstimulation in AD is supported by studies reporting that blocking of NMDA overstimulation with partial NMDAR antagonists alleviates neurodegeneration in various animal models (Decker et al., 2010; Rönicke et al., 2011). This partial NMDAR antagonism is suggested to account for the beneficial clinical effect of memantine in AD (Danysz et al., 2000). As mentioned previously, increased Aβ levels potentially initiate a pathway leading to tau-mediated synaptic dysfunction. Under normal conditions, tau is translocated from the dendritic shaft to postsynaptic compartments under synaptic activation. Concomitant to postsynaptic translocation of tau, Fyn kinase is recruited to the postsynaptic compartment, which phosphorylates NMDAR, facilitating the interaction between PSD-95 and NMDAR and NMDAR stabilization (Ittner et al., 2010; Frandemiche et al., 2014). This stabilization of NMDARs, are potentially necessary for LTP-associated synaptic potentiation (Frandemiche et al., 2014). However, dissociation of the Tau/Fyn/PSD-95/NMDAR complex seems to be equally crucial as this complex is suggested to mediate Aβ-related excitotoxicity (Ittner et al., 2010). Interestingly, increase in Aβ levels potentiates the localization of tau, Fyn, and PSD-95 to postsynaptic sites independent of synaptic activation. In turn, translocation of Tau, Fyn, and PSD-95 is impaired by increased Aβ levels during synaptic activation, potentially disrupting LTP-required synaptic potentiation (Frandemiche et al., 2014). An increase in oligomeric Aβ has also been shown to reduce tau threonine 205 (T205) phosphorylation, which is a key tau phosphorylation site regulating the stability of the Tau/Fyn/PSD-95/NMDAR complex (Ittner et al., 2016). Under normal synaptic activation, post-synaptically localized tau is phosphorylated on threonine 205 by p38γ, dissociating the Tau/Fyn/PSD-95/NMDAR complex. In turn, p38γ-mediated tau phosphorylation is largely decreased upon excess Aβ exposure (Ittner et al., 2016). Collectively, Aβ is essential for synaptic transmission, but its accumulation leads to impairment in regulation of LTP/LTD induction, potentially through mechanisms related to NMDAR activation, NMDAR and AMPAR trafficking, and tau translocation and phosphorylation in dendrites. Neuroinflammation in AD is thought to be primarily driven by microglial cells. Aβ oligomers and fibrils are capable of priming microglial cells through interactions with various receptors, which enhance the production of inflammatory cytokines and chemokines [interleukin-1, interleukin-6, tumor necrosis factor α (TNF-α), C1q etc.] and make microglia more susceptible to secondary stimuli, promoting microglial activation (Heppner et al., 2015). In AD, aggregation of Aβ results in chronic activation of primed microglia, enhancing production of inflammatory cytokines and chemokines, which in turn further aggravate primed microglia (El Khoury et al., 2003; Stewart et al., 2010). More specifically, recent findings highlight a critical role for the activation of the NACHT-, Leucine rich repeat- and pyrin-domain-containing protein 3 (NLRP3) inflammasome, which in addition to promoting pro-inflammatory cytokine release also induces the assembly of adaptor protein apoptosis-associated speck-like protein containing a CARD (ASC) to helical fibrillar structures (Venegas et al., 2017). These structures, better known as ASC specks, accelerate Aβ aggregation and spreading, and potentially sustain the ongoing immune response via activation of surrounding immune cells (Figure 1). This vicious cycle impairs microglial functions, affecting astrocyte, oligodendrocyte and neuron functions, in addition to potentially promoting tau pathology and ultimately neurodegeneration (Heppner et al., 2015). Consequently, prolonged activation of microglia can result in microglial cells acquiring a detrimental phenotype, which is thought to be irreversible (Miller and Streit, 2007). Additionally, a role for microglia in postnatal synaptic pruning has been demonstrated, with complement proteins potentially playing a pivotal role in regulating the extent of pruning (Paolicelli et al., 2011; Stephan et al., 2012). Complement protein C1q has been shown to be upregulated up to 80-fold in human AD brains, and to activate the complement cascade upon detection of Aβ oligomers (Kolev et al., 2009; Figure 1). In AD mouse models, complement system is initiated via the classical, lectin or alternative pathways, leading to cleavage of C3 with subsequent downstream effects on microglia-specific synapse engulfment, activation of microglial inflammatory signaling and lysis of synapses via formation of C5b-C9 membrane attack complex (Hong et al., 2016). This results in enhanced microglia-mediated synapse loss, further driving neurodegeneration. Importantly, knockout of C3 protects against neurodegeneration in aged plaque-rich transgenic mice (Shi et al., 2017). As a further support for the involvement of complement cascade in the pathological processes relevant for AD, knock-out of CD59 protein, which inhibits the C5b-C9 membrane attack complex, aggravated the tau pathology in aged P301L mutant tau transgenic mice (Britschgi et al., 2012). Taken together, microglial cells play a major role in different facets of AD-associated neuroinflammation and synaptic elimination processes. Further, specific molecular determinants in microglia, such as TREM2, are central for the function and activity of microglia in these processes. It has become evident that specific microglial checkpoint mechanisms, such as seclusion from circulation, soluble restrain factors, cell–cell interactions and transcriptional regulators restrain the microglial immune activation throughout life, thus promoting the homeostatic functions of microglia in central nervous system (CNS; Deczkowska et al., 2018). Consequently, these checkpoint mechanisms may limit the capability of microglia to protect CNS when vigorous immune response is needed. Interestingly, a study employing transcriptional single-cell sorting in a mouse model of AD revealed a novel microglia type associated with neurodegenerative diseases (DAM; Keren-shaul et al., 2017). DAM was shown to be regulated through a two-step activation mechanism. In the first step, which was TREM2 independent, increased expression of specific set of genes, such as TREM2-signaling adaptor protein (DAP12/TYROBP) and APOE was detected, while the homeostatic microglial markers, such as CX3CR1 and P2RY12, showed decreased expression. The second step involved a switch toward increased expression of specific genes, such as TREM2, LPL, CST7, and CLEC7A, which was dependent on the TREM2 status (Keren-shaul et al., 2017). Importantly, the identified DAM genes are closely linked to phagocytic and lipid metabolism pathways, and DAMs are localized in the vicinity of Aβ plaques in plaque bearing transgenic mice and post-mortem AD samples. Apart from AD, DAMs function as phagocytic cells in other neurodegenerative diseases, such as amyotrophic lateral sclerosis (ALS), but also in the aging (Keren-shaul et al., 2017). At the same time, it was reported that TREM2-APOE pathway drives transcriptional phenotype of dysfunctional microglia in neurodegenerative diseases (Krasemann et al., 2017). More specifically, expressional induction of APOE upon aging and disease progression in mouse models of ALS, multiple sclerosis (MS) and AD was instrumental for the development of the specific molecular signature of common disease-related microglia alongside with the suppression of tolerogenic TGFβ signaling (Krasemann et al., 2017). Both APOE-induced and -repressed gene sets, including some of the key microglia-specific transcription factors, were identified upon injection of apoptotic neurons to the cortex and hippocampus of wild-type and APOE knockout mice (Krasemann et al., 2017). Again, the APOE-mediated regulation of microglia was found to be TREM2-dependent as the genetic targeting of TREM2 (TREM2 knockout) supressed the APOE pathway and restored the homeostatic microglia in mouse models of AD and ALS (Krasemann et al., 2017). Further support for the seminal role of TREM2 in microglia was obtained when human TREM2 gene dosage was increased in the 5xFAD mouse model of AD (Lee et al., 2018). Elevated levels of TREM2 reduced the expression of DAM-specific genes alongside with the mitigation of the AD-related pathology in the brain of 5xFAD mice. Importantly, increased levels of TREM2 rescued the down-regulation of neuronal genes and reduced phagocytic activity of microglia observed in 5xFAD mice, as well as reduced neuritic dystrophy and improved memory performance. In line with these findings, the activation or up-regulation of TREM2 enhanced the phenotypic conversion of microglia and decreased the number of apoptotic neurons in mice with acute brain ischemia (Zhai et al., 2017). 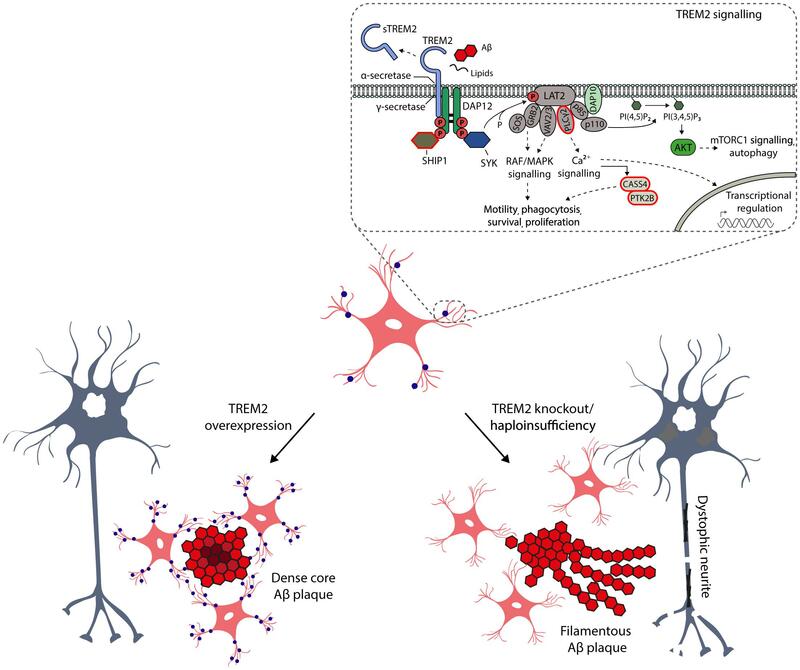 Collectively, these data indicate that microglial activation stages and the RNA signature of specific DAM genes are closely linked to TREM2 in AD and in other neurodegenerative diseases (Figure 2). Figure 2. Schematic representation of the key role of TREM2 in the microglia functions and activation. TREM2 is a cell surface receptor in microglia, which by interacting with activating adaptor protein DAP12 initiates a signaling cascade leading to enhancement of pathways regulating phagocytosis, motility, survival and proliferation of microglia. TREM2 binds several ligands, such as phospholipids, lipoproteins, heparin sulfate proteoglycans, as well as apoptotic neurons and oligomeric Aβ. Importantly, TREM2 is also a target for α- (ADAM10) and γ-secretase-mediated cleavage, resulting in the release of soluble TREM2 (sTREM2) from the ectodomain into the interstitial and further to cerebrospinal fluid. Therefore, sTREM2 is actively been evaluated in CSF as a potential early biomarker for neurodegenerative diseases (Suarez-Calvet et al., 2016). The CSF levels of sTREM2 are increased in the asymptomatic individuals carrying the causative mutations for AD, suggesting that the activation of microglia takes place several years before onset of the disease, but importantly after the amyloidosis and neuronal injury have already emerged. There are several AD-associated non-synonymous variants in TREM2, which are located at the ectodomain of the receptor. Apart from these variants, recent GWAS studies have identified novel AD-associated risk genes, which are expressed selectively or preferentially in microglia (circled in red) and which are at least partially linked to TREM2 signaling pathways. Studies conducted in genetically manipulated TREM2 mice have provided compelling evidence that the TREM2 is the key activator of microglia upon Aβ-induced neuroinflammation, affecting the microglial barrier, metabolic fitness and autophagosomal activity of microglia as well as compaction of Aβ plaques and formation of dystrophic neurites. Given the seminal role of TREM2 in the DAM, it is crucial to distinguish the underlying molecular mechanisms of this myeloid cell-specific membrane receptor in the physiological as well as AD-associated pathological conditions. It is well-established that TREM2 binds different extracellular ligands, such as phospholipids, lipoproteins, heparin sulfate proteoglycans, and apoptotic neurons, which activates intracellular signaling pathways affecting the phagocytotic activity, migration, survival and proliferation of microglia (Figure 2; Yeh et al., 2016; Park et al., 2018). Moreover, microglia have been suggested to take part in extracellular Aβ phagocytosis, and mutations in TREM2 gene affecting TREM2 shedding, decrease TREM2-dependent microglia activation and phagocytosis (Schlepckow et al., 2017). It was recently also shown that TREM2 is required for synapse elimination in the developing brain, emphasizing the TREM2-dependent microglia-mediated synaptic refinement (Filipello et al., 2018), which may also play a significant role in the neurodegeneration. Importantly, TREM2 is also a receptor for oligomeric Aβ, and the AD-associated variants in TREM2 gene (R47H and R62H) compromised the interaction of TREM2 receptor with oligomeric Aβ (Zhao et al., 2018). In the same study, TREM2 was also shown to regulate the catabolism of Aβ in microglia mainly via proteasomal degradation pathways. Apart from this, the role of TREM2 in autophagosomal degradation in microglia was recently highlighted in an AD mouse model (5xFAD), in which TREM2 deficiency impaired mTOR signaling and metabolism in microglia, thus leading to marked induction of autophagy (Ulland et al., 2017). Interestingly, the augmented autophagosomal activity, which is beneficial in terms of reducing inflammation and Aβ load on short term, promoted the formation of dystrophic neurites in Trem2-/- 5xFAD mice. This suggests that impaired mTOR signaling owing to TREM2 deficiency is harmful and deteriorates the metabolic fitness of microglia in the long term. Consistent with these results, haploinsufficiency of TREM2 in mice impaired the formation of microglial barrier around the Aβ plaques and hence decreased the ability of microglia to envelope Aβ deposits. This reduced compaction of Aβ plaques and increased the total surface area of Aβ fibrils and axonal dystrophy around the plaques (Yuan et al., 2016). Similarly, Apoe-deficient mice displayed significantly less compact amyloid plaques together with reduced Aβ plaque-associated microgliosis and the expression of specific DAM genes, as well as increased number of dystrophic neurites around the fibrillar Aβ plaques (Ulrich et al., 2018). Consistent with this, APOE was significantly upregulated in aged mice and mouse models of amyloidosis and tauopathy (Krasemann et al., 2017; Kang et al., 2018). In all of these conditions, a shared set of microglial transcripts were under control of APOE-driven network (Kang et al., 2018). As discussed above, the opposite effects were reported in 5xFAD mice, in which the up-regulation of TREM2 was applied (Figure 2; Lee et al., 2018). However, it should be noted that conflicting data also exist related to the functional outcome measures of TREM2 in mouse models of amyloidosis and tauopathy (Jay et al., 2015; Bemiller et al., 2017; Leyns et al., 2017). Nevertheless, these results provide compelling new evidence that TREM2 acts as a master switch, that regulates the activity and function of microglia in AD and other neurodegenerative diseases. In addition to microglia, altered astrocytic activity has been proposed to have negative effects on Aβ clearance and synaptic functions. Among several functions, astrocytes modulate extracellular levels of neurotransmitters by uptake and recycling of glutamate through Na+-dependent glutamate transporters (Anderson and Swanson, 2000). Studies utilizing transgenic AD mouse models describe that astrocytes undergo atrophy prior to Aβ plaque accumulation, eventually resulting in deficient glutamatergic transmission, potentially contributing to early stage eNMDAR overstimulation (Olabarria et al., 2010). In addition, astrocytes have been described to reside within the vicinity of Aβ plaques, taking part in the proteolytic clearance of Aβ (Medeiros and LaFerla, 2013). Furthermore, astrocyte activation followed by the release of APOE from astrocytes has been shown to be crucial for the ability of microglia to remove fibrillar Aβ (Terwel et al., 2011). Moreover, exposure to Aβ increases the expression of Aβ-degrading enzymes in astrocytes (Heppner et al., 2015). Irrespective of the described beneficial features of astrocytes, inhibition of astrocyte activation in AD mouse models has been shown to ameliorate AD-like pathology (Furman et al., 2012). This apparent discrepancy may be explained by the fact that activated astrocytes can be subdivided into two categories, A1 and A2 reactive astrocytes (Liddelow et al., 2017; Clarke et al., 2018). More specifically, microglia secreted cytokines (IL-1α, TNF-α, C1q) induce A1 astrocytes, which lack many normal astrocytic functions such as the ability to promote neuronal survival, outgrowth, synaptogenesis and phagocytosis (Figure 1). Moreover, A1 astrocytes induce the death of neurons and oligodendrocytes. Conversely, induction of A2 astrocytes is associated with an increase in neurotrophic factors, suggesting a neuroprotective role. Increased abundance of A1 astrocytes has not only been described in AD, but also in Huntington’s disease, Parkinson’s disease, ALS and MS (Liddelow et al., 2017). Thus, a better understanding of microglial-astrocyte communication and functions for specific astrocyte subtypes is required. Research focusing on unraveling the pathogenesis of AD has largely been driven by the amyloid cascade hypothesis, and AD-associated neuroinflammation has been assumed a late-phase response to pathobiological events. Recently, the role of inflammation in AD has been re-evaluated, as GWAS studies have reported several AD-associated genes beyond TREM2, including ABI3, CASS4, CD33, CR1, HLA-DRB1/5, IL1RAP, MEF2C, MS4A1, MS4A4E, PLCγ2, SHIP1, and PU.1 that are expressed selectively or preferentially in microglia (Heppner et al., 2015; dos Santos et al., 2017; Sims et al., 2017; Bis et al., 2018). Importantly, many of these above-mentioned AD-associated risk genes belong to microglial signaling pathways, which regulate survival, motility, phagocytosis, calcium signaling and gene expression at least partially through TREM2 signaling (Figure 2). Finally, large scale network-based transcriptomic and proteomic studies have identified that microglia as well as immune genes and pathways most strongly associate with the pathophysiology of AD (Zhang et al., 2013; Seyfried et al., 2017). Taken together, these genetic findings suggest a potential role for the immune system in the onset and progression of AD, thus further addressing the involvement of microglia in the early stages of AD pathogenesis. The disregard of the potential role of immune system at the early stages of AD has hindered our understanding of AD-associated neuroinflammation. 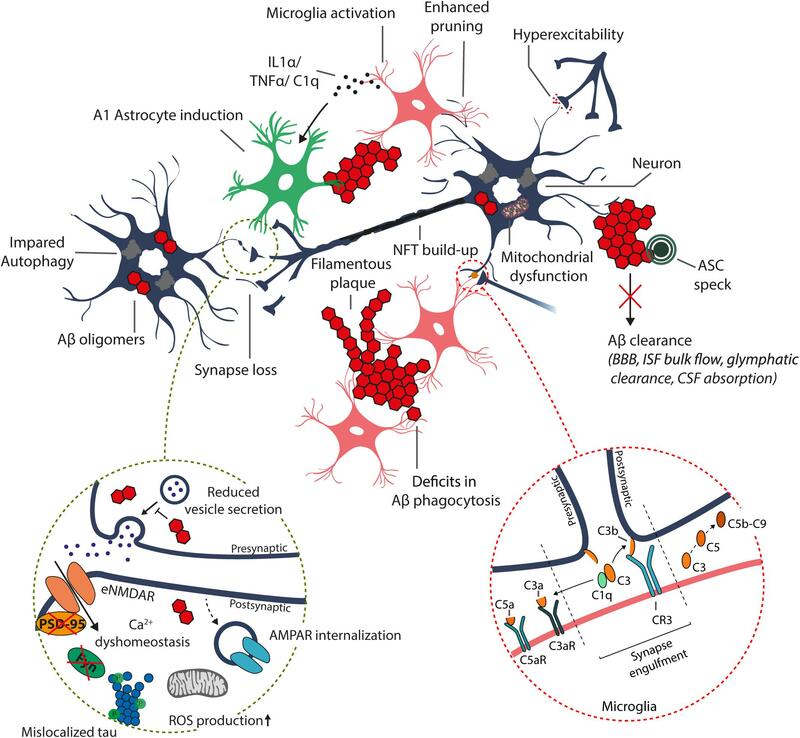 Therefore, recent discoveries related to the underlying molecular mechanisms of neuroinflammation and synaptotoxicity in AD pathogenesis may provide potential novel therapeutic targets and antecedent biomarkers, which are intimately linked to the activity modulation of microglia and astrocyte and their interplay as well as remodeling and engulfment of synapses. The new emerging technologies in single cell analyses, imaging of synaptic and glial functions in humans using novel PET tracers, and novel human-derived cellular models, such as 3D human triculture system to model neurodegeneration and neuroinflammation in AD (Park et al., 2018), will inevitably reinforce the development of new treatment strategies for AD. Furthermore, there are already promising unconventional approaches, such as breaking the immune tolerance by targeting regulatory T-cells to mitigate the AD pathology (Baruch et al., 2015), which will set the basis for other alternative approaches for modulating the onset and progression of AD beyond the conventional Aβ-targeted strategies. MM, MT, AH, and MH designed and outlined the structure and contents of the review. All authors contributed to the literature review, discussion, and writing of the manuscript. This study was supported by Academy of Finland (Nos. 307866, 315459, and 288659), Sigrid Jusélius Foundation, the Strategic Neuroscience Funding of the University of Eastern Finland, and Neurocenter Finland – AlzTrans pilot project. Bis, J. C., Jian, X., Kunkle, B. W., Chen, Y., Hamilton-Nelson, K. L., Bush, W. S., et al. (2018). Whole exome sequencing study identifies novel rare and common Alzheimer’s-Associated variants involved in immune response and transcriptional regulation. Mol. Psychiatry doi: 10.1038/s41380-018-0112-7 [Epub ahead of print]. Prince, M., Comas-Herrera, M. A., Knapp, M., Guerchet, M., and Karagiannidou, M. M. (2016). World Alzheimer Report 2016 Improving Healthcare for People Living with Dementia Coverage, QualIty and Costs Now and In the Future. London: Alzheimer’s Disease International. Scheltens, P., Blennow, K., Breteler, M. M. B., De Strooper, B., Frisoni, G. B., Salloway, S., et al. (2016). Alzheimer’s Disease. Available at: www.thelancet.com. Copyright © 2018 Marttinen, Takalo, Natunen, Wittrahm, Gabbouj, Kemppainen, Leinonen, Tanila, Haapasalo and Hiltunen. This is an open-access article distributed under the terms of the Creative Commons Attribution License (CC BY). The use, distribution or reproduction in other forums is permitted, provided the original author(s) and the copyright owner(s) are credited and that the original publication in this journal is cited, in accordance with accepted academic practice. No use, distribution or reproduction is permitted which does not comply with these terms.